Apocynaceae. Zones 10-11. 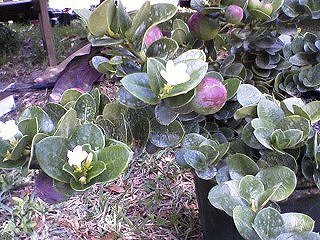 A fast growing evergreen shrub to 6 feet, producing abundant two inch white fragrant blossoms shaped something like a gardenia, often year round in South Forida, followed by small red plum-like fruits. This plant has been often used for bonsai and is easily adaptable to container growing in colder climates. Produces small thorns, which are not a serious problem. The shiny foliage, flowers and fruits are great reasons to grow this plant, indoors or out. Does not tolerate much frost, likes full sun to light shade. Can be used as a hedge in warm climates.